How do you put a value on 'natural capital'? Economists across government are used to analysing the costs and benefits of options to help policy-makers. For example, assessing the revenues that can be raised from tax changes and the costs this might impose on the public - all of those costs and benefits are represented by market prices in the economy. In the arena of transport, that thinking is extended – market prices provide costs for new infrastructure, but analysts also use techniques to put a monetary value on the time savings that might emerge for users of a new transport system. Yet people can feel sceptical of economists using these approaches when considering environmental decisions – how can we place a value on clean air, a beautiful landscape, or fresh water - our natural capital? In fact, isn’t attributing such values wrong? The first thing to say is that valuing environmental ‘goods’ is tricky. We have markets that can give us the value of a car or a house, but there are no markets that give us the value of the environment. This is related to the classic economics problem of externalities, where one person’s actions to improve or damage the environment has a consequence for others yet this is not properly rewarded or penalised through the market without intervention. For example, if Firm A produces a product but, as a consequence, pollutes a river and negatively affects other water users. So how can governments decide on the value of regulating a polluting firm or improving a part of the landscape? They could try to make these decisions without quantifying environmental benefits or costs in monetary terms. However, in so doing they will often be placing an implicit monetary value on such environmental improvements - that, let’s say, a cleaner river, is worth X million pounds of cost (for the sake of argument, the cost of compliance to a polluting firm) or not. Where possible, it would be better to value those environmental improvements formally, up front. This helps decision-makers understand the full range and value of environmental impacts; decide whether an environmental change is worth the investment it requires; and allows them to consider the benefits of improving the environment alongside other potential uses of public money. In essence, it answers the economists’ challenge of deciding the best use of our scarce resources. Revealed preference techniques - these analyse market data for non-environmental goods to infer a value for an environmental good – for example, looking at how house prices vary according to local environmental features; the time and cash costs people incur in travelling to a National Park; the willingness of individuals and organisations to spend on compensating for the loss of environmental goods and healthy natural assets, such as air filters, water treatment facilities, or flood defences. Stated preference techniques - these cover studies undertaken to ask structured questions or using ‘choice experiments’ to establish people’s willingness to trade-off money for an environmental improvement. While this approach has the potential to be less robust than revealed techniques, it has the advantage of addressing the change in benefit directly, in river or habitat restoration, for example. They can also uncover genuine ‘non-use values’ that nature has for us, such as the value placed on knowing that an environmental improvement will benefit other people (altruistic motives) or future generations (bequest motives). Defining value in this way also aims to ensure it is the wider ethical values of and benefits to society that are used in decision-making, not those imposed by others. Valuation studies using this range of techniques have generated a substantial evidence base over the last 20 years, although many gaps remain, which are being addressed by a lively research agenda. Defra and its partners have been seeking to develop these values to help guide decision-making for a number of years. The concept has moved further since 2011 through the work of the Natural Capital Committee (NCC) - an independent advisory committee established by government, which provides advice on how to ensure England’s ‘natural wealth’ is managed efficiently and sustainably, unlocking opportunities for sustained prosperity and wellbeing. it allows prioritisation of those environmental improvements with greatest value, and speaks the language of finance ministries by enabling value-for-money decisions. 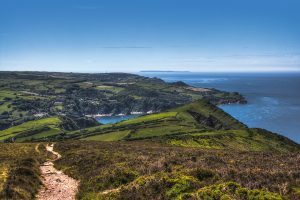 The NCC and Defra work closely with the Office for National Statistics (ONS) to develop estimates of the UK’s natural capital. The most recent estimates indicate its asset value (based on the flow of benefits we receive) at around £500 billion. This estimate, albeit experimental, includes the market value of benefits (such as the value of woodland timber), but two thirds of the valuation is attributable to non-traded services such as recreational amenity, air filtration, and carbon capture and storage. 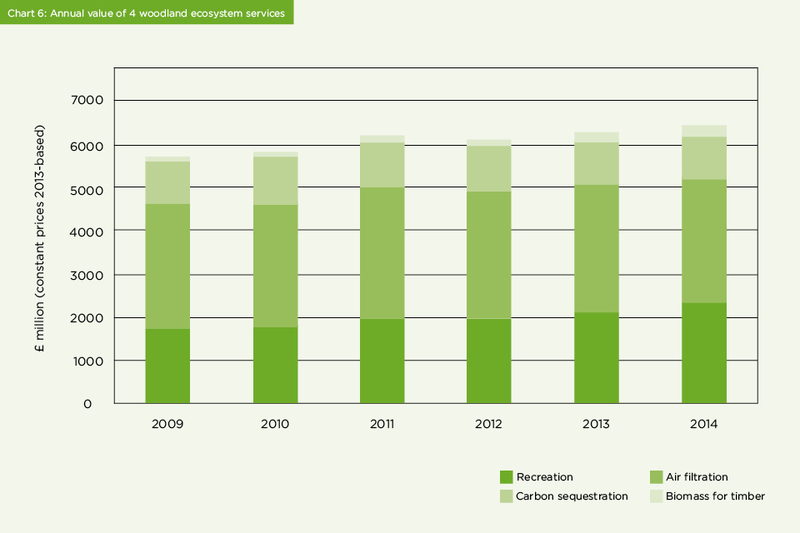 In the case of woodland, the discrepancy between these non-market benefits and the economic value of forested timber is greater still, as the experimental estimates given in the chart below show (with timber at the top) [source: ONS Environmental Accounts 2016]. There are a number of ways that decision-makers in government and more widely can put these concepts and estimates into practice. First, Defra is building the information on environmental economics, valuations and appraisals to help everyone make the right decisions. It plans to make this publicly available through an Environmental Portal as part of its approach to open data. Already, information on the recreational value of any public green space in England can be accessed online on the user-friendly ORVal tool – http://leep.exeter.ac.uk/orval/. This tool is now being used by Defra’s agencies in strategic and project analyses and was mentioned in the recent Housing White Paper. 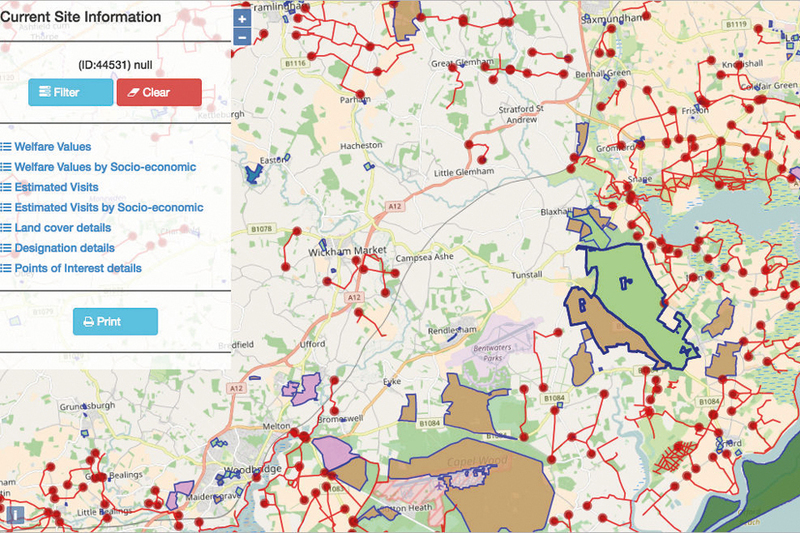 The University of Exeter, funded by Defra, developed the Outdoor Recreation Valuation (ORVal) tool in order to quantify the recreational benefits that are provided by accessible greenspace in England. ORVal is an online map-based application that allows users to explore accessible greenspace across England in a user-friendly, intuitive way. Based on a cutting-edge, world-leading statistical model of recreational demand, ORVal brings data together and provides information that can now be included in the decision making of communities, Government and businesses. The online tool is in map form, giving people the opportunity to explore recreational opportunities close to them. It also helps connect them with their local environment, both in urban as well as in rural areas as the map below shows. Second, appraisals across government are guided by the Green Book which sets out best practice. Ensuring natural capital is well integrated into this approach can help guide decision-makers on the best choices, secure the greatest net gain for society and deliver maximum value for money for the taxpayers. Third, the NCC recommended the establishment of pioneers to use the natural capital approach to identify good practice and innovative solutions. Across the country, in Cumbria, Greater Manchester, Devon and East Anglia, this is being put into practice so local communities and decision-makers can use these insights to improve the environment within their areas. Upstream Thinking is a project undertaken by South West Water in Exmoor and other water-catchment sites in the region. Joint investments between farmers and the water company ensure that land is managed in such a way that potential water pollutants including peat, soils and natural fertilisers are kept on their land and do not run off into surrounding water courses. This brings benefits to the farmer (in terms of lowering the costs of operations), to the water company (which does not have to invest as much to treat the water downstream) and wider society (which benefits from having healthier rivers for recreation, angling and enjoying wildlife). By funding improvements in water and slurry management at source, South West Water has cut the costs of its operations. Such interventions are proving to be good value for money. Furthermore, improving the quality of water catchments is not just good for water quality but has other benefits too. For instance, re-wetted peat bogs also capture and store carbon dioxide, create habitat for plants and animals, reduce pests for the livestock that graze nearby and increase recreation values. Of course, developing these concepts is not easy. When using values, it is important to take care and continue to address the limitations of the methodology. ‘Stated preference’ methods, for example, work best where respondents have reasonably well-formed preferences and understand the trade-offs with market goods and money. Instead of cost-benefit analysis, there are other approaches, such as multi-criteria analysis (MCA), which is highlighted in the Green Book, to help decision-making. This technique involves systematically weighting success criteria and scoring options to inform decisions. It can incorporate a wide range of evidence to inform the process as well as the judgements of experts and stakeholders. For highly complex and dynamic environmental contexts, where the maintenance of critical, irreplaceable natural capital needs to be considered, or where stated preference studies may not work because preferences are not easily articulated, Defra has published a guide and case studies. This guide recommends using ‘participatory and deliberative’ techniques to support standard valuation approaches (http://randd.defra.gov.uk/Document.aspx?Document=NR0124.pdf). And, in the case of the environment, it is also critical to be particularly attuned to issues of uncertainty. For example, where scientific evidence may be developing; in threshold effects, where reduction of a good below a certain level may make it particularly vulnerable; and irreversibility, such as the loss of a species. Nevertheless, using economic concepts and valuation can help ensure the very best information for decision-makers, ensure the environment’s enormous value is appropriately recognised, and help create a great place for living. I would like to thank a number of officials at Defra for their assistance in compiling this article. In particular, Nick Barter and Julian Harlow of Environment Strategy and the Natural Capital Committee Secretariat, and Colin Smith of the Environment Analysis Unit.